For those of you who are my age or older, you can probably remember well the first time you saw the amazing physique of Serge Nubret: It was in the pseudo-documentary we all now know and love as “Pumping Iron.” With the director and writers of Pumping Iron attempting to make out the film as a “David vs Goliath” with the young (but massive) Lou Ferrigno taking on the older “Goliath” in the form of Arnold Schwarzenegger, they had no idea that their whole half-true enterprise would crumble a bit with the entry of Serge Nubret. You took one look at Nubret and you knew there was no doubt that Ferrigno was out of his league with both Schwarzenegger and the Frenchmen. (Nubret was French.) Nubret - to this day - had one of the most classically beautiful physiques of all-time. Arnold, of course, won the whole thing, but Nubret easily came in 2nd. By the time I watched Pumping Iron sometime in the mid to late ‘80s, there was very little information that I could find on Nubret’s training methods. The sole source for bodybuilding information, of any sort, in those days were your major bodybuilding magazines, and Nubret, being already retired by that point, wasn’t in any of them. It wasn’t until I read a lot of articles in MuscleMag International - primarily by Greg Zulak and Robert Kennedy - that I began to understand Nubret’s sort of unique training. I say “sort of” because what Nubret did wasn’t anything particularly new, but he took it to unique heights, heights that were only surpassed by his fellow amazing Frenchman, Thierry Pastel. To be honest, good information on Nubret’s training is still fairly scant, even with the advent of the internet. If you do a search, for instance, on “Serge Nubret training” you basically get one article that has been rewritten or “re-worded” - or just plain copied - on a number of different websites. Nubret’s training was actually fairly simple when looked at from an outsider’s point of view, but it doesn’t really take into account the mindset of Nubret or the amount of “instinctive” training he used, a technique used by many other bodybuilders of the “golden age” that trained with higher reps and higher volume. So, what was his training? In a nutshell: a lot of sets, a lot of reps, a lot of exercises, which means a lot of volume. There. You happy? I didn’t think so. First off, I seriously doubt that was the routine that Nubret followed every week. 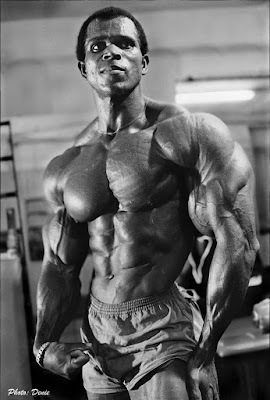 As with many of the programs I have posted here in the past, that is an example of a Serge Nubret routine, but not the end-all, be-all that created his majestic physique. Let’s break down his training a little bit, so that - if you so choose - you can actually use his techniques for yourself. Nubret liked to use moderately light weights for all of his sets. He would focus on form, and use what we might say in a cliched way to be “mind over muscle.” He would really focus his mind so that he was concentrating on the muscle being used, and ensuring there was tension throughout the set. The weight also had to be light because he believed in using minimal rest between sets. 30 seconds between sets was nothing for Nubret! His training, in this way, is very similar to Vince Gironda’s “6x6 Program”. Gironda used this program to train several great IFBB bodybuilders in the ‘70s and early ‘80s, including Chris Dickerson when he won the title in 1982. For Gironda’s program, you typically picked 3 to 5 exercises per bodypart (depending on the size of the muscle), and picked a weight where you would probably fail around the 10th to 12th rep if you were training to failure. You then did 6 sets of 6 reps on every exercise, taking only 30 to 20 seconds of rest between sets. The pump and soreness you get from this program is out of this world. Dickerson, when he won the title (so the story goes), reached the point to where he was only resting 15 to 20 seconds between sets! Gironda called this sort of training - as did others from his era - “chasing the pump”. Nubret’s reps are (obviously) higher than 6 on each set, and Nubret reportedly like to train to failure on all his sets. I don’t advise that sort of training until you reach an advanced level. Keep in mind that, when designing a program, you need to properly manipulate volume, intensity, and frequency. It’s best, for a program such as this one, to keep volume and frequency high while keeping intensity relatively low. Only highly advanced bodybuilders, such as Nubret was, can use high volume, high frequency, and high intensity. My advice is to keep your reps in the 10 to 12 range but pick a weight where you typically fail somewhere around the 20th repetition. By keeping rest between sets to a minimum, your intensity will be plenty high enough. Trust me. This gives you four days of rest between obliterating your muscle groups with 20 sets (or thereabouts) of failure training. This means that your volume and intensity will be high, while your frequency is low. As you adapt to the training, and find that you are not as sore the day after a workout, then you can consider repeating the workout on Day Five instead of Day Six. Eventually, if you want to reach the volume of Nubret, you could even consider cutting out the day off on Day Three altogether. Serge Nubret was not a Frenchman, he was not even European, he was African. Serge Nubret was born, I believe, in the Caribbean, but he spent most of his life in France. And he was always listed as "French" in bodybuilding magazines and in the movie Pumping Iron. Also, he died in Paris. I use Serge Nubret's full routine which has given me the best results of my training years. I gained around 30lbs to my frame in 6 months and people close to me accused me of steroid use. Exceptional results but it is a brutal routine. I strongly implore people to at least try this - it was life changing for me and i will be forever grateful to the great Serge Nubret. Thanks for this article, he was a class act and should be remembered.